At past 10 years, computed tomography (CT) scanners place rigorous demands on all of their subsystems and components. 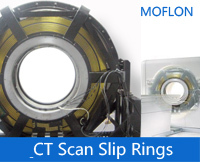 The dramatic increase in the functionality of CT, including cardiology, oncology and acute care, places requirements of robust, artifact-free imaging on all elements of the data generation, transmission and processing system..
One of the primary challenges within a CT scanner is the requirement to transmit image data from the rotating x-ray detector array to the stationary data processing computer. In the earliest CT scanners, this data transmission task was accomplished with a slip ring, i.e., sliding electrical contacts. With the ever increasing data speed requirements of multi-slice machines, an alternative method of handling data across the rotating interface is required.